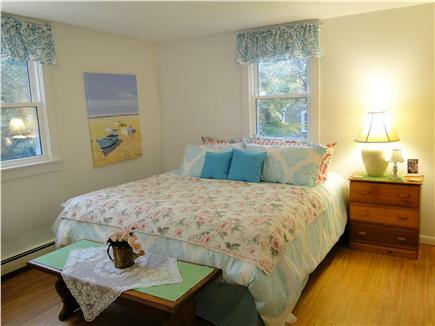 This air conditioned retreat is located within walking distance (4/10 of a mile) of the popular and beautiful gulf stream warmed Ridgevale Beach. It is a short jaunt (2.5 miles) into Chatham's quaint old-fashioned downtown, with many specialty boutiques and shops. This bright and decorated home offers a fully equipped kitchen, living room and high definition flat screen TV, 2 bedrooms including the master bedroom, and a full bath all on the main floor. 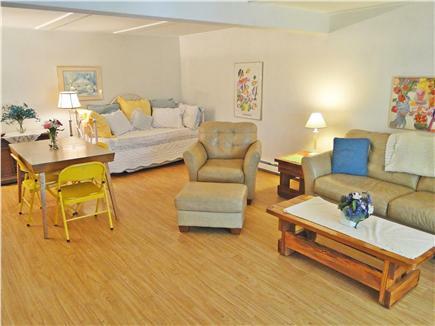 The finished basement includes a spacious family room for dining and entertaining, additional trundle bed, high definition TV, another full bath, and the third bedroom. The laundry room is also on this level. Wireless internet is provided on both levels. This home is ideal for families, relatives, and/or friends wanting separate and complete living quarters between the two separate floors. For fun and relaxation this home offers a large private deck with table, chairs, umbrella, and a charcoal grill with supplied charcoal. 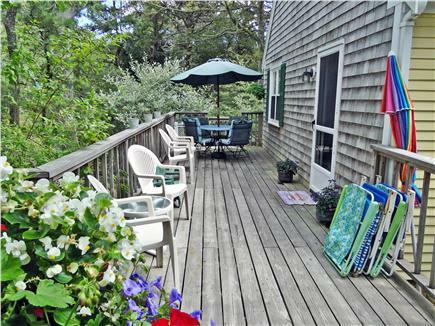 For family adventure this home is just minutes away from the Chatham spur of the Cape Cod Bike Trail. It is also a 5 minute walk to Marion's Pie Shop. We also have a portable crib for toddlers. Additional pricing info: Discount available for booking multiple weeks. State and local taxes of 12.45% will apply. About our green amenities: We have a clothesline for the drying of clothes and beach towels. We thank you for our wonderful stay. We enjoyed staying here in this house. Great memories. Thank you for a wonderful place to call home for our week. First Night in Chatham was wonderful. Many great memories! Linda and Bob, Thank you for letting us stay in your lovely home. We enjoyed every day of our vacation and celebrated our sons 29th birthday with a perfect lobster dinner. Hope to see you again. We spent some wonderful days in your lovely home. 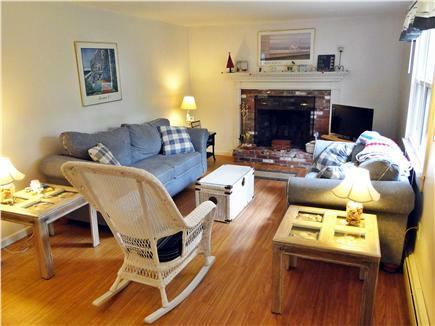 Everything was as advertised and we enjoyed Cape Cod at it' best -specifically in fall. Weather was picture perfect. 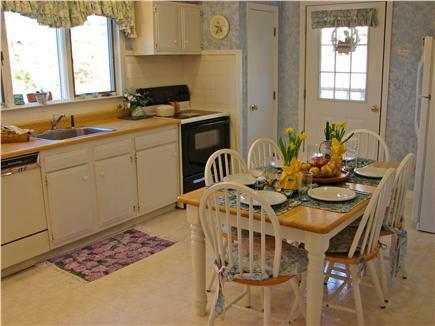 We would love to return to your cottage anytime and relax some more days with friends or family in your spacious home. Thank you for taking good care of us and providing everything we needed. Linda, What a great way to spend Columbus Day weekend on Cape Cod! Chatham by the Sea was perfect for us. 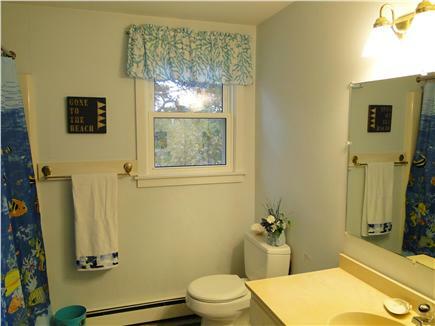 Your home had everything we needed and the Chatham location (beach, restaurants, bike path) was perfect. Thank you for sharing your wonderful home! We had a beautiful restful week. The kids loved the beach as well as running on the deck! Hope to stay again! Linda and Bob, Thank you very much for letting us stay at your home. We all had a great time as we did last year. God willing we hope to see this beautiful place next year. Thank you!! Thank you, Linda and Bob, for the use of your home on our recent stay. The location was wonderful, and your home was comfortable and spacious. My daughter's friends were sorry that they planned for such a short stay and were amazed that they had their own living quarters downstairs. We had a wonderful time and are looking forward to returning. Hello, My name is Linda Hurley. 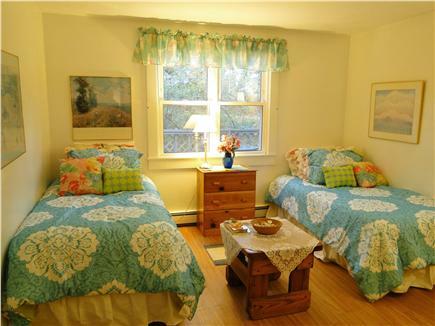 Together with my husband Robert Del Vecchio we have rented our cottage for 20 years. 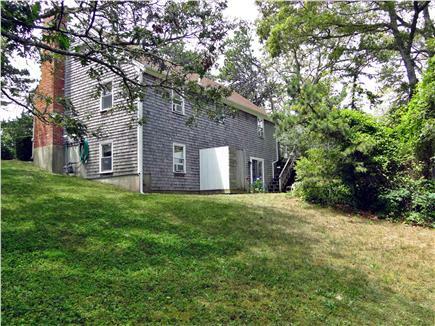 We live in Chatham year round about 2 miles from the cottage. 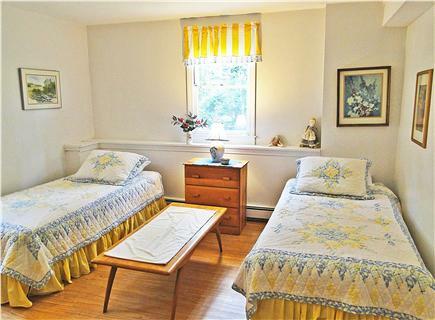 Since we are both retired educators, for years we were able to conveniently rent this property during the active summer months. We continue to fully manage and maintain the property year round and look forward to hosting and meeting families from all over the region. 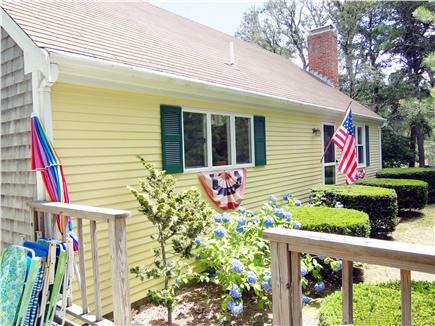 The cottage is quaint and is decorated in Cape Cod charm. 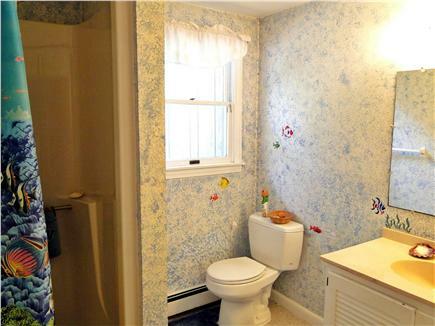 Because both the first and second floors have both a bath and common living areas, families can easily spread out with plenty of privacy. The large deck is great for outdoor dining and relaxing and adds to the total living space. Chatham is truly a special Cape Cod town. With its unique downtown with its specialty shops, downtown Chatham is a charm. 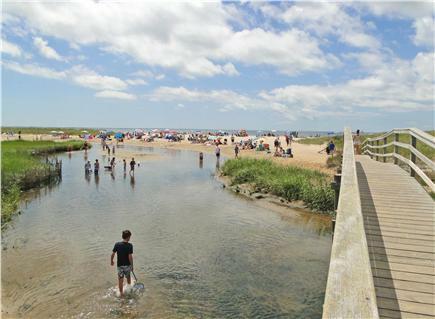 From the Chatham Lighthouse to the Chatham Anglers baseball games, Chatham has much to offer.